One of the best applications for personal development is mind mapping, and there’s no denying recognition must be given to Tony Buzan for his initial formalizing of hand drawn mind mapping @ 40 years ago now. Using the rules of Buzan mindmapping is actually quite an easy yet disciplined approach to populating your personal mind map with thoughts, ideas and potentials. I must be clear; I’m not a Buzan purist or even mind map according to Buzan methodologies; yet the Buzan approach to mapping remains to be the most effective introduction to mind mapping for newcomers to, in particular, the mind mapping arena. Software developers exponentially enhanced the Buzan approach expanding the single radiant format into multiple formats that we now call visual mapping. This includes but isn’t limited to mind mapping, concept mapping, flow charting, info graphics and other graphical approaches that are common to business, such as value stream mapping. The multiple formats offered by products and services such as Mindjet MindManager productivity range and CS Odessa’s ConceptDraw suite have expressed the multiple formats approach most succinctly. Of course there are other products that compete, but I cite these two developers as leading the pack with their unique approaches to products and services. Mind mapping though seems to linger on as a peculiar tool that many are initially dumbfounded at; that’s until they realize the potential for inclusion into their mainstream information management activities. But the majority IMO and experience seem to view mind mapping as a drop back to the hippy days of the 60’s when it was the groovy thing to use to express thoughts and feelings. Expanding into visual mapping is indeed where we experience the multiple formats that enhance, and in many cases exponentially increase the users functions and capabilities of effective information management. Visual mapping is likened to a visual information management tool box for the visual thinker of this century; one that includes tools that may not be mind mapping, but indeed enhance the user’s ability to expand upon the initial expressiveness of mind mapping. So one size fits all simply doesn’t apply within the visual mapping tool set, and that applies especially to Buzan mapping for sure. I firmly believe thought that the mind map is an excellent foundation to what may expand into a personal development plan of action, academic enhancement and a Business productivity project management approach. But the mind map may not, and in most cases, isn’t the final product or presentation viewed by the larger intended audience. Mindjet seem to have established a well rounded approach via their productivity product/services to this mindset. In my many years of activity within information management arenas, that includes QMS and manufacturing; I’ve come across, as you may have also, strategies, tools and methodologies that have come and gone as so called flavours of the month. But there’s one methodology called Kanban that’s simply not going away any time soon. 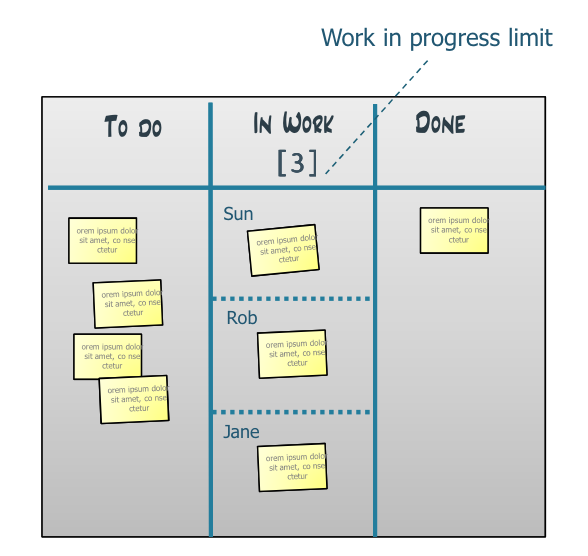 Kanban is a very simple to use and implement “get it done” type of linear process board. 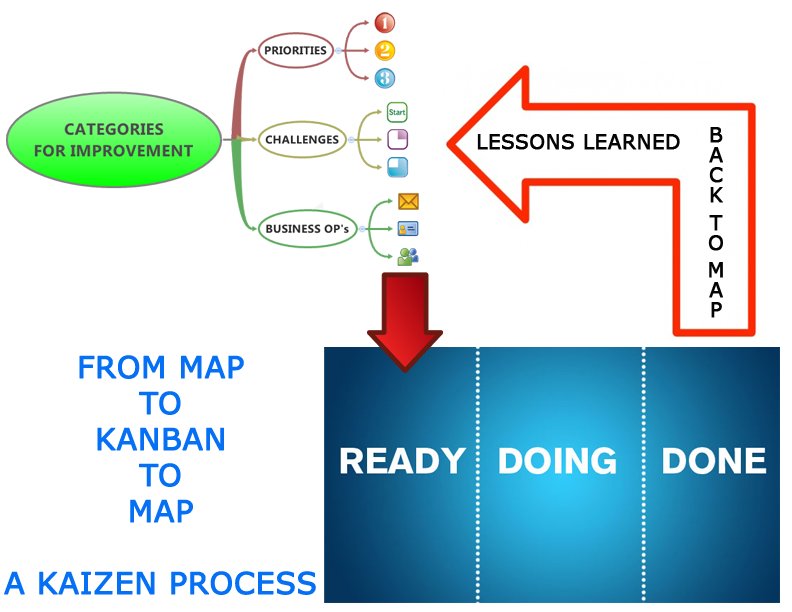 Kanban enforces a very regimented process of pulling prioritized lists into a well defined three (or more) column natural flow that infuses a get it done mindset with a continuous improvement decision loop. 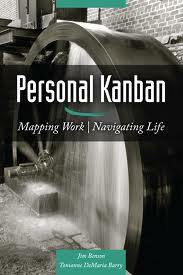 Within the past year I read a well written book titled “Personal Kanban” authored by Jim Benson and Tonianne DeMaria Barry. This publication grabbed my interest, as I was in somewhat of a transition period; looking for unique ways in which to enhance the use of mind-visual mapping for personal development. FYI my friend and colleague Pascal Venier recently translated the Personal Kanban book into French: alors maintenant mes collègues français n'ont aucune excuse pour la petite bête lire cette excellente publication (my poor attempt at understandable French). so I started to experiment with combining visual mapping formats that could interact with a Kanban output. At the time of this article there are no software enhancements or add-ins that enables a map to Kanban output from developers such as Mindjet (desktop and cloud), CS Odessa (cross-platform desktop) or the leading cloud Visual mapping application MindMeister. I do see though the possible development of the Kanban output within the existing Mindjet services associated with their cloud collaborations tools. The CS Odessa ConceptDraw suite may indeed be looking at this function too, and it would be great to see MindMeister realize this challenge also. Of course the only capable third party developer is Olympic Ltd; being IMO the best developer of add-in capability for this arena, as Nigel Goult seems to always have his finger on the pulse of what Visual mapping users (and in particular MindManager users) actually need and want ;why the hell don’t the developers think like Nigel? 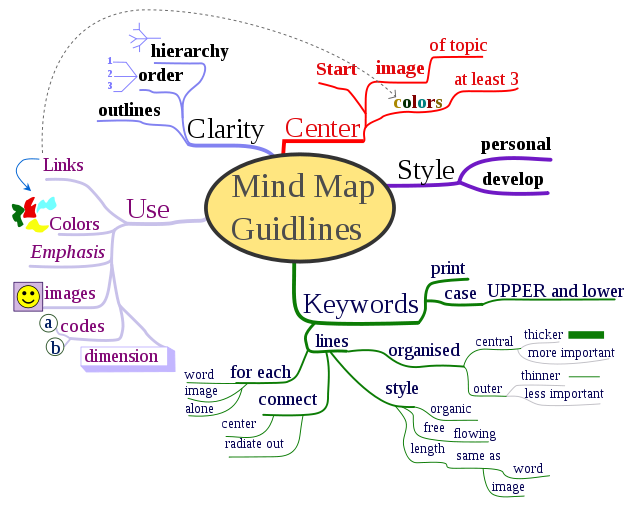 The mind map has unfortunately been a secret weapon of many users. Secret: because those who have used and mastered the tools, methods and mindset of mind-visual mapping tend to keep it their secret weapon. They simply use the tool to establishing for themselves the most creative, innovative and productive position within their environment of use. And; they’ll only share the tools, methods and mindset when they have established their position as being the information management “guru” type within their environment. This indeed is the nature of humans to do this. Here's hoping Liam Hughes and his team at Biggerplate will change this perception. 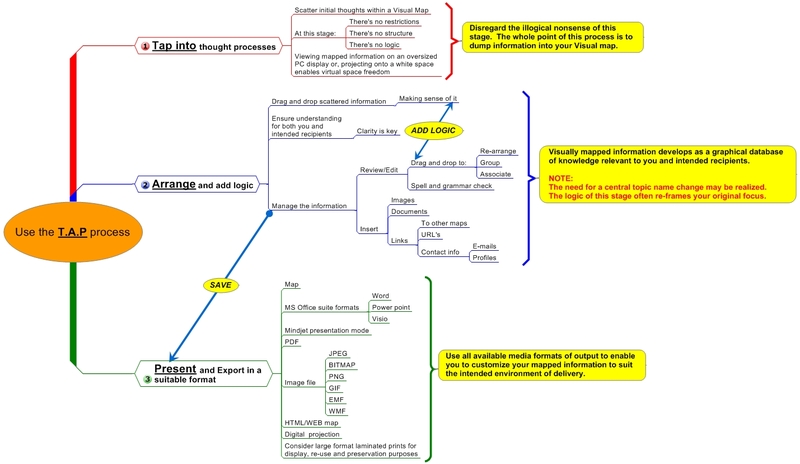 Look at the mind map as a space where we can dump many or all of our thoughts regarding any procedure, process, system. Quite a few years ago I developed a “no brainer” set of procedures that culminated in a process I call The T.A.P method. In reality it’s one of those maps that you look and say to yourself “yeah so what”. The example below is the initial format I came up with, and I invite anyone to use, abuse and improve upon the T.A.P method. This method though is IMO a very good procedural foundation for tapping into your though processes using either traditional Buzan rules or even more modern Visual mapping approaches espoused by the main stream developers. Looking at the mind-visual map, and realizing those formats, as powerful as they are, simply don’t encompass the genesis and revelation of what we are trying to do whilst using the tools, methodologies and mindsets. I realized and have found the mind-visual map to be the genesis of though processing in the form of tapping into our thought processes. The conclusion of the visual map is to arrive at a place where you have gathered all relevant information relating to your personal, academic and business needs and wants. The further process is to understand the end result of your visual mapping process, and gathered information should IMO be a series of conclusions that have been established within your map. I like to use the power of 3. I tend to work in processes of 3 in order to arrive at 3 conclusions. When I see the series of 3’s; I can then present those series of 3”s into the first column of my Kanban board. The first column is named READY. I place 3 needs (or to do’s) into the ready column. I then drag and drop according to my personal requirements. When this is done, I simply PULL a need into a column called DOING, and I get to the process of doing. Once I have completed the process I pull the completed process into the DONE column. The issue is to experience a “lessons learned” moment at DONE portion of your Kanban, and this is the Kaizen or continuous improvement portion of the DONE process. Of course there’s more to this process and this article is incomplete without the input of the Personal Kanban authors, software developers and consultants within this profession. As usual I covet your comments and feedback. I certainly encourage you to purchase the Personal Kanban book and experiment with your use of visual mapping into your personal Kanban. There’s much more to be said @ where the visual map fits into the T.A.P and filtering into a Kanban. I’m hoping the software developers and authors of the excellent “Personal Kanban” jump all over this interesting approach..